I lost exact count long ago, but I'd estimate that I've downed somewhere between 150 and 200 bowls of ramen in the last year. Miso ramen, tonkotsu ramen, shôyu ramen, shio ramen, curry ramen, spicy ramen, cheese ramen, soupless ramen, tomato ramen, kimchi ramen, too many bowls to count. But for each of those bowls, one thing has been constant - I've been sitting in front of the shop counter, eating. For all the bowls of ramen I'd eaten, I had never stood behind the counter, never been inside of a ramen shop's kitchen, never prepared a bowl of (non-instant) ramen myself. But a few weeks ago, all that changed, if only for a day. 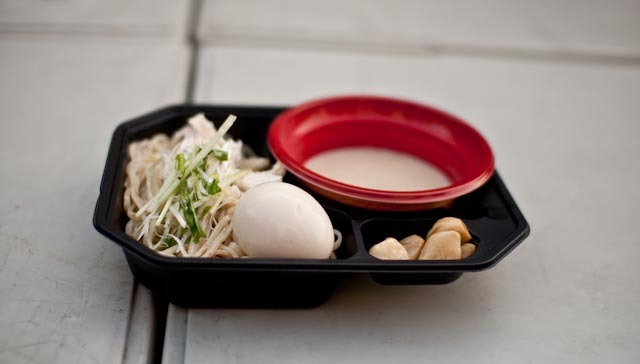 The Great Tsukemen Exhibition had rolled into town, in which almost 30 shops show their chops at preparing tsukemen (dipping noodles) over the course of three weeks. 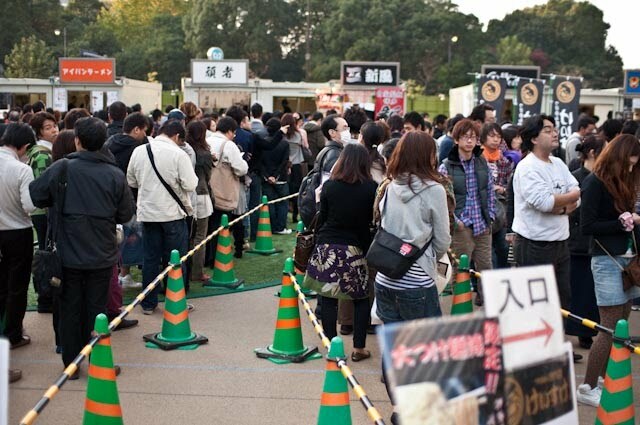 The listed of attending shops read like a who's who of the celebrity ramen world, with top shops from Tokyo plus visitors from as far as Niigata, Tôhoku, and Fukuoka. Week three of the festival included none other than Ivan Ramen, the nation's only ramen shop run by a fast-talking New Yorker, and the employer of my buddy Keizo. 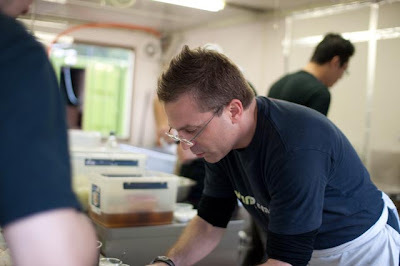 Though I'd only just met Ivan, he offered Brian and I the opportunity to volunteer at the festival, helping out and getting to experience life on the line in a ramen kitchen. I foolishly forgot my camera battery that day, so much thanks to Brian for generously sharing his photos from the day - these are all his. We showed up at Ivan's kitchen trailer at 10 AM, beshirted,betowled, and reporting for duty. The park hosting the festival didn't open until 11, but the hungry masses were chomping at the bit, and the line to get in was already a few hundred deep. "And they're off!" Aforementioned hungry masses began streaming in the gate at 11:00:00, scattering to each shop's line as they speedwalked with vigor to the day's first bowl. Within minutes, Ivan had a few dozen hungry customers waiting to eat his special limited time only "White Chicken Tsukemen." We worked at full bore for the full day, lining up the bowls and knocking them down. There was barely a minute to take a sip of tea, let alone a break. The people need their noodles! After a bit of shuffling, I spent the first part of the day on soup pouring, bowl prep, and expediting duty, stirring the finished broth of chicken, veggies, and fruits of the sea and spooning it into the never ending flow of plastic bowls moving through the kitchen. From there I made sure each bowl was in order, wiping edges, rearranging toppings, and moving the bowls to the final station for extra toppings and service. 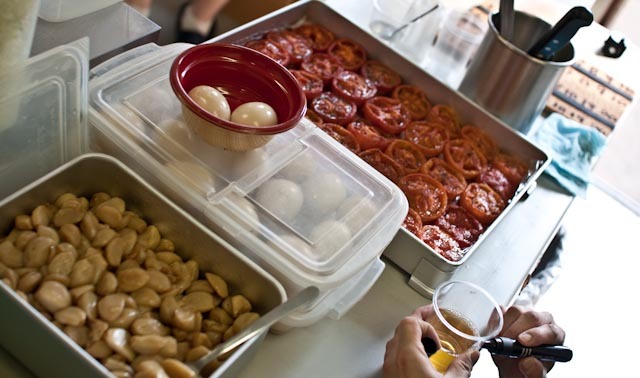 In addition to the standard soup and noodles, customers could add on soft-roasted garlic, roasted tomatoes, and luscious soft-boiled eggs, lovingly schlepped by Keizo and company on public transportation to the festival site. The masses knew what was good for them, because five hundred of Ivan's famous tomatoes were gone in a matter of hours. I spent the second part of the day preparing the salad and arranging the basic toppings on the noodles. 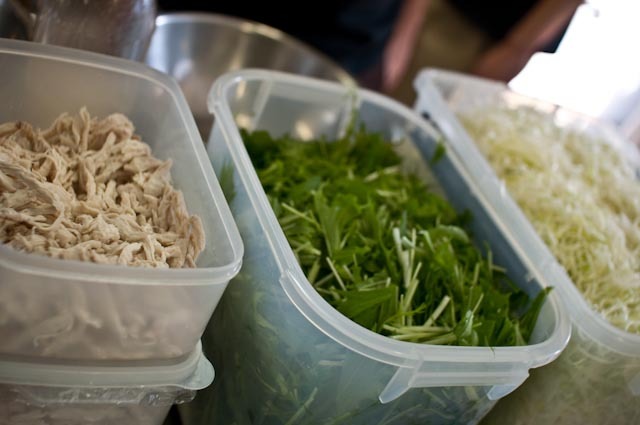 Hear the noodle boiler's call, throw in mizuna greens and chopped onions accordingly, toss, season, add just a hint of dressing, then be ready to put the salad and chicken on each serving of thick wheat noodles just as they're laid into the bowl. If you time it right you can have the toppings ready to go just as the noodles are pulled from the boiling water. Too fast or too slow and you've got a bottleneck on your hands. 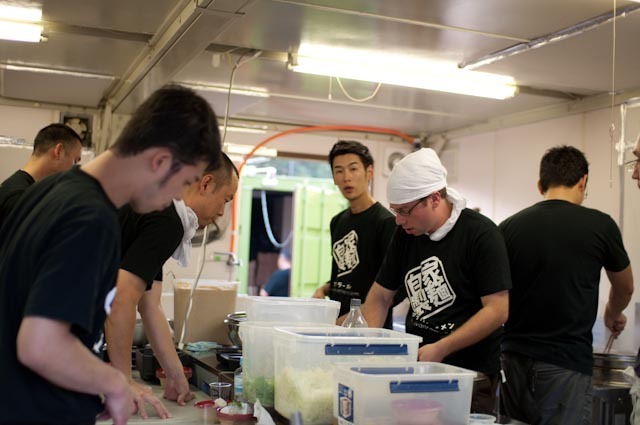 There were seven of us working that day, and I really came to understand what a team effort the preparation of ramen is. Each person has their own job, and every last one contributes to getting the noodles to the customer as fast as possible. When things go smoothly, it's a pretty amazing feeling. Sometimes I would get in the zone, finding the perfect rhythm and feeling everything but the preparation of the bowl fall away. Everything that is, except the bumping strains of oldies and dance numbers being piped in over the radio. 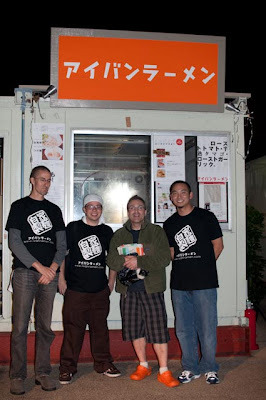 Other times the pace slowed a bit and I got the chance to chat with Ivan, Keizo, Brian, and the rest of the team, as well as survey the room to see for myself everything that goes into a bowl of delicious ramen. 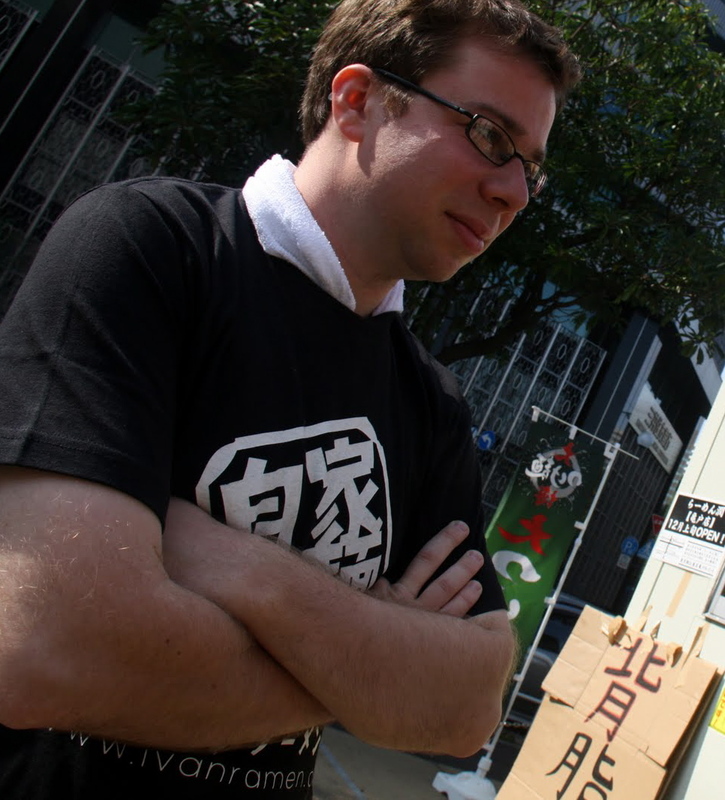 But there are some secrets to running a ramen shop that can't leave the kitchen. So, just what were we making? Here it is, our beautiful bowl. I finally got to try it for myself when break time rolled around in the mid afternoon, sucking down the dark wheat blended noodles and smooth, thick chicken soup. Granted I'm a bit biased, but I sure dug it! I spent the rest of my break surveying the happy throngs and marveling at how much happiness a bowl of noodles can bring to so many people. I also caught a glimpse of the reknowned "Ramen Demon" Sano Minoru, who even cracked a smile through his famously stony exterior. Sano's was easily the most popular shop of the set, with noodle fans queuing up three hours to try his bowl. After a few stretching exercises it was time to get back to work...but not before gruzzling a free bowl from Yondaime Keisuke. Then it was back to work, pushing through to the end of the festival at 9 PM. Things slowed a little bit, but the hunger of the people of Tokyo is tough to sate. 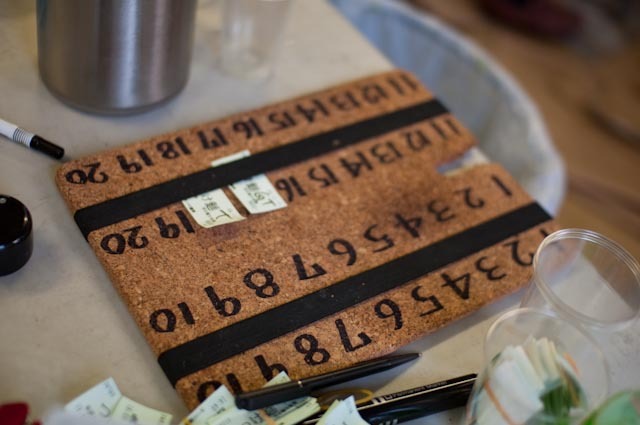 When we counted up tickets at the end of the day, the total came to 1210 bowls served. That's 120 bowls an hour; 2 bowls a minute for ten hours straight. I had a blast working in the kitchen, and can't remember the last time standing for ten hours straight felt so good. Preparing ramen is labor, and I still had it easy, only working a single day, and not having to show up at the shop at 5 AM to begin boiling and prep. When I went out to do a final set of stretches in the evening, the head cook of Tsubame's Ramen Jun turned to me and asked, "What's your day job, kid?" Devoting oneself to a life of ramen is devoting oneself to a life of hard work. Having donned the towel and sweated in the kitchen for just a single day, I gained a new level of respect for every past, present, and aspiring ramen cook. It may only take a few minutes to slurp a bowl, but hours, days, years, and lots of work (and hopefully more than a little love) went into that bowl. After cleaning up and shutting down for the day it was nearly ten PM. All that was left for me was to drink a few beers and get a good night's sleep, but I knew the rest of the team would be back at it early tomorrow morning. Before going our separate ways, Keizo, Brian, Ivan, and I posed for a commemorative shot. Four men, brought together by a love of noodles...and soup. Ever since the festival, I've looked at each shop a bit differently, approached each move of the cook and each bowl with a new eye (and tongue). What can I say, I love the stuff. A big thanks to Ivan for giving me this amazing experience! nate, this is a very inspiring post. you mentioned the festival draws the best and most famed ramen chefs. this is something i have not been able to learn about. can you recommend any trade publications or magazines about ramen to keep up on this stuff, even through pictures? my japanese isn't good enough to pick these out of amazon.jp or kinokuniya.